As Executive Director of Education and Global Development, Dr. Kyle Phillpots has for 18 years spearheaded the education department of the PGA, always seeking to find the best information, courses and platforms to deliver to keep PGA members on the leading edge of knowledge related to the game and their business. For many years he had been searching for a putting course and in 2010 he visited Frank Thomas and Valerie Melvin at their Frankly Golf Putting Studio in Orlando Florida, and was most impressed by what he learned. 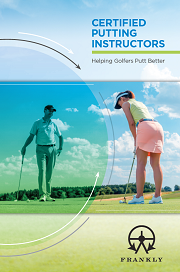 Shortly thereafter, Dr. Phillpots asked Frank and Valerie if it would be possible to build an online course that PGA members around the world could access, as it was apparent that the knowledge delivered in such a course was a wonderful opportunity for the PGA professional to add to their business services. “The CPI Course is a business opportunity for our members. Every professional has a putting green and the CPI adds an extra component to what they can offer. According to Dr. Phillpots, the CPI Course also allows the professional to specialize and differentiate themselves, with business benefits. 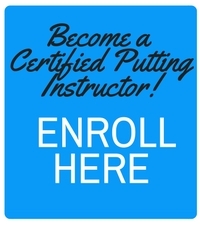 “The CPI Course is of benefit to our members because of the structure and the opportunity to operate in an untapped area of putting. The pupil can be confident in the knowledge passed on by the professional. The professional is not demonstrating to the pupil, rather he is empowering the pupil. The other huge aspect of the CPI Course is the fact that the certification is conducted online, which according to Dr. Phillpots, is the future of education. “Online learning is a big thing in education. It allows the learner to study at a time and place they determine as structured by the teacher. In our time pressured society this is very important. “As an example, to deliver the information presented in the CPI Course, Frank and Valerie would have to travel around the country and deliver to a large number of people, repeating themselves at each stop. This is very inefficient. The essence of online is that people learn in their own time, they can replay the videos, re-read the text until they feel comfortable with the contents. Research suggests that if a learner focuses in a class, they retain 20% of the information. So, with online learning, the ability to go back and review it is very beneficial. This opportunity is not available in face to face learning, not to say that face to face learning doesn’t have its place in education. Dr Phillpots sees a bright future for the CPI Course as it grows into other continents, being adopted by other PGA’s around the world, most recently launched in a fully translated version for ongoing education in Japan. Frank Thomas, founder of Frankly Golf, longtime USGA Technical Director and inventor of the graphite shaft is delighted to see the CPI Course develop and evolve internationally. “We are privileged to have worked with Kyle to develop the online CPI Course which is gaining momentum as more professionals reap the business rewards of the course and are seeing the benefits of the course,” said Thomas.